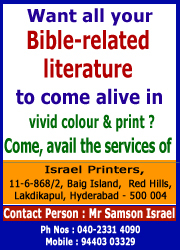 �All Scripture is God-breathed (II Tim 3:16) and He doesn�t waste His breath� noted a noted Christian. If that is so, can we as His children (John 1:12) honestly claim to be reading sincerely the entire Bible? Or do we have some favourite portions that we read more often (travelers� Psalms 91,121 for instance) while ignoring, some other Scripture portions on the wrong premise that they are not applicable to New Testament dispensation? For instance, do we read with elan the Scripture portions that cover the Jewish festivals ( Leviticus 23/ Numbers 28-29)? There is so much to discern from them and praise God for. Well, this PPS is a study on what the Jewish Festivals mean to us of the New Testament era. View it and even as it edifies you, resolve to circulate the reference link to your friends and beyond (nothing quite like it, if you can pass on this link to your Jewish friends, if any). Ps�Anyone inspired by the Good Lord may freely use this presentation for edification of his friends/acquaintances. NO COPYRIGHTS ISSUES HERE PLEASE, ONLY ONE REQUEST�COPY THE MATERIAL RIGHT, WITHOUT ANY CHANGES.